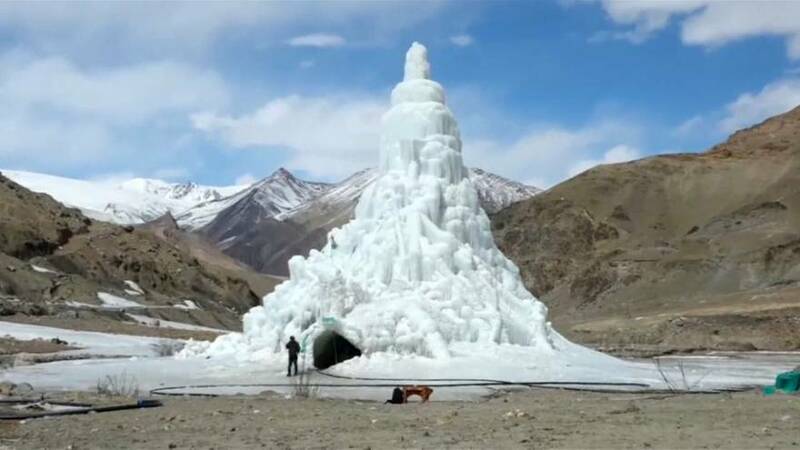 Tourists in the Indian mountain village of Gya in Kashmir state can now enjoy hot drinks and eat traditional noodles inside an ice sculpture resembling a Buddhist meditation place. A mound-like structure made of ice acts as an artificial glacier and is one of the most popular forms of conserving winter wastewater in high desert cities. These structures are formed by running pipes under the frost line or the freezing depth and then pushing water through these pipes into cold air which causes it to land as ice on the ground. As these towers melt in late spring, the meltwater is collected in tanks and fed onto planted land using a drip-irrigation system.